In like a lion, out like a lamb! March was a busy month in Kindergarten! I enjoyed meeting with almost everyone at conferences and was excited to share all the progress that has been happening this year. From the nurse: Please be aware that we continue to see strep and flu in the community. Please encourage your parents to keep their child home if they sick and keep them home until they are fully well. Also, please have them contact the nurse to inform of any contagious illnesses. In ELA this month, we have continued to work on trick words. Trick words are words that don't follow the rules and can't be sounded out. Ask your child to name so trick words! In writing, we are working on adding more detail and background to pictures, and telling more about what we are writing. We are talking about spaces between words and periods at the end of sentences. In handwriting we continue to practice writing the lowercase alphabet. In reading, we are have begun conferencing during Reading Workshop. This is a time for teachers to check in with readers either individually or in small groups. Children are doing more reading of leveled books. We have begun RAZ-Kids and you will be receiving information about using this awesome program at home very soon. We are reading the chapter book Ramona Forever. We continue to practice blending and segmenting words and are determining whether or not words are real or “nonsense”. Math: This month we have been exploring 2D shapes. We have played games including Fill the Hexagons and Build a Spaceship. We have sorted shapes by their attributes and worked to fill in shapes with paper pattern block cut-outs. We have built with Exploragons and geoboards. Ask your child what the math word is for a diamond. In Open Circle we have been talking about how to solve problems. Ask your child about the traffic light steps to solving a problem. On the interactive whiteboard we are sorting pictures by shape, practicing our handwriting, and building words using all the short vowel sounds. Most exciting this month we completed our first STEAM project. Children worked with a partner, first with some pre-STEAM cooperative activities and finally building a bird feeder. See the photo page for some parts of these projects, including seeing actually birds coming to the feeder. Ask your child what makes their feeder sturdy, or what they might change if they built another one. We have seen the state bird of Massachusetts at our feeders, ask your child its name! May 15th-field trip to Broadmoor-stay tuned for permission slips and chaperone information. February went by in a flash and the rate at which Room 102 is growing and learning is staggering! ​We have read and decorated many more poems and songs for Valentine’s Day. We continue to read Ramona Forever. In Fundations, we have started to learn about trick words. A Trick Word is a word that does not play by the rules. It is a word containing at least one part that cannot be read correctly via blending or cannot be spelled correctly using the code knowledge taught so far. So far we have talked about the trick words a, am, for, I, is, the, like, me, on, see, to, was, and, my, you and are. You can practice recognizing, reading and writing these words at home! In writing, we brainstormed lists of things we did over the February vacation, and wrote and illustrated stories to go with them. We continue to work on leaving spaces between words, stretching out words to hear sounds, and using our best handwriting. We have begun writing in our Fundations journals. I look forward to sharing this writing with you at the parent conferences. Math: This month we have continued to work on addition and subtraction. We have learned more fun math games. We played an addition and subtraction game with Legos. We have started math RTI (Response to Intervention), a multi-tiered approach to teaching math that targets instruction based on individual needs. We are working on building number sense, counting skills, and more and less. Science: We have begun talking about our next unit materials and motion. We have been learning about the properties of wood. The children had a chance to try and make a piece of wood sink in a tub of water. Ask your child to tell you about this fun experiment! Dear Families, What a busy month we have had! ** Remember that Wednesday is gym and children should have appropriate shoes. **We would still appreciate a note in the folder (preferred) or email in addition to making dismissal changes on Pikmykid to avoid any confusion at the end of the day. In ELA this month, we learned how to form our uppercase letters. We have been practicing blending and segmenting words. We have been tapping out sounds in words, focusing on 3 sound cvc words with short vowels. We have read and decorated more poems, including January, Snow, Chubby Snowman and many more. In writing, we brainstormed lists of things we like to do on snowy days. And finally some snow came so that we could do those things! In reading, we are building our understanding of concepts of print. We are reading the chapter book Ramona Forever. Math: This month we have begun addition and subtraction. We have told number stories about adding and subtracting, and written and illustrated number stories. We have learned some fun math games, BUMP, Die Minus One, and Addition Cross Out. We have met the characters GUS the PLUS, who is so nice and always giving more, and LINUS THE MINUS, who isn’t so nice, taking things away. Open Circle: We have been reviewing what we have learned about so far in Open Circle. We have been talking about the size of the problem, and how to match your reaction to the problem, whether big, medium or small. On the interactive whiteboard we are practicing handwriting, reading our morning message, learning about tally marks, and learning how to write number sentences, like 5+2=7. We are also reading short books and talking about concepts in print. We continue to enjoy “brain breaks” movement and dance during indoor recess and transition times. The class is working on Symphony Math on the classroom ipads and in Skills Lab. Dear Families, Happy Holidays and Happy New Year! I hope you are enjoying a restful and joyful time with family. Peace was present in Room 102 this December. I wanted to thank you all again for the very generous gifts. Be on the lookout in the coming weeks for a new sign up for volunteer opportunities in the new year. We will be looking for STEAM and art volunteers, as well as a brand new game leader volunteer. Have a favorite family game? Bring it in and teach us how to play!! Just want to play? We have many games and eager players so just come in and play! A note about STEAM: Children LOVE going to the STEAM center every Friday afternoon and parents have been gracious in their time cutting, taping, gluing and offering design advice. What you may see as a pile of trash is actually a thoughtfully created project by a future engineer! To date countless projects have been built including: a hat, a candy hider, a game, a penguin, a boat, a house, a music maker, a bunny, a robot, a kitty cat, binoculars, a jewelry box, glasses, a design, and a candy holder to name a few. In ELA this month, we finished learning sounds for all consonants and the short vowels. We are beginning to build cvc words, stretch out words to hear more sounds, and isolate beginning, middle and end sounds. We have been practicing reading skills including sentence structure, rhyming and counting syllables. In handwriting we have finished learning how to form all the lowercase letters. In writing, we continued to write and draw about our weekends. We wrote about ways to get calm when we are upset. In reading, we are building our stamina in Reading Workshop, spending more and more time reading independently. We now spend about 15 minutes with our book bins, reading books, poems and songs. We finished Beezus and Ramona, and are about halfway through Ramona the Brave. Ask your child if Ramona has a hole in her house!! Math: This month we began to learn about measuring. We continue to practice counting and number sense to 20. We have been talking about patterns. We are working on greater than, less than, and equal to when answering our question of the day. Ask your child if they can draw you a < or > sign between 2 numbers. cultures) the Rekenrek combines various strengths of other manipulatives (e.g., number lines, base-10 blocks, counters, etc.) in one accessible tool. The Rekenrek is comprised of two strings of ten beads each, strategically broken into two groups: five red beads, and five white beads. Readily apparent in this model is an implicit invitation for children to think in groups of five and ten. The strings of red and white beads (in groups of 5) provide a visual model that encourages young learners to subitize,i.e., to build numbers based on groups of five and ten. Open Circle: In Open Circle this month we have talked about the whirly burly snowstorm in our brains and practiced ways to calm down when we are feeling overwhelmed. We also practiced ways to deal with annoying behavior. On the interactive whiteboard we have played measuring and sorting games. We are enjoying “brain breaks” -movement and dance during indoor recess and transition times. The class is working on Symphony Math during skills lab, and Lexia on the classroom ipads. We have been taking a closer look at weather. The children have a weather graph and they visit the classroom thermometer every day to fill in their graph. We talked about a tool for measuring the wind. The children constructed their own wind socks and we got to test them. Most excitingly, we participated in the global movement, the Hour of Code. We introduced coding to the kindergarten through the Bee Bots. Ask your kids about the Bee Bots! Symphony Math is an “at school tool” for math growth. The math curriculum specialists ask that you do not use this program at home! Buddies: We are buddies with Mr. Owen’s 4th grade class. So far we have gathered twice, once the students made a getting to know you book and read a book and then we enjoyed a long recess on a nice day together! Volunteers: A reminder that if you are coming into the classroom to volunteer, you must complete a CORI form. Stop in the office and request a form to fill out before coming to the classroom. A new sign up for STEAM, art and game volunteer will be coming out soon, of course if you have another date that you would like to come in, just send me an email and we can arrange something. January 2nd, school is open! January 21, NO SCHOOL, Martin Luther King Day. Please remember to teach your child to dress themselves for outdoor winter play, especially zipping coats and tucking in mittens and snowpants. I recommend sending your child’s snow gear in a separate bag, typically a grocery recycle bag works well. Dear Families, November flew right by and we are having great fun in room 102! In ELA this month, we learned the sounds and lowercase letter formations of many letters including a, g, d, s, e, r, p, and j. We are isolating sounds as beginning, middle or ending in words. We have read and decorated many more poems and songs for our black folders including Albuquerque Turkey, Thanksgiving Dinner, and many more. In writing, we continue to write and draw about our weekends and things we like. We talked about what it means to be thankful and wrote about it on leaves for a kindergarten tree on display outside the gym. We read about the 1621 Harvest Feast and a Native American story about Giving Thanks. We continue to read the chapter book Beezus and Ramona. Ask your child what Ramona did to the apples. Math: This month we learned about greater than, less than, and equal to. We continue to practice counting and number sense and have been comparing numbers. We have been talking about attributes and built attribute block trains where we change only one attribute from car to car. We played math games including Guess My Rule, What’s Missing, and Die Minus One. Open Circle: In Open Circle this month we have talked about the Double D's, which is behavior that is Dangerous or Destructive. We also talked about behavior that is not a Double D, but just annoying, and we acted out ways that children can manage when someone is being annoying. On the interactive whiteboard we are learning to use tally marks to keep track of numbers when we answer our question of the day. We are also learning to make the greater than, less than, and equal to symbols. We are using flipcharts to practice writing letters and numbers. We have begun RTI (Response to Intervention) early intervention groups. These groups are flexible and will change over the course of the year. Jen Socha, the reading specialist, and Julie Cote, the kindergarten special educator, are involved in meeting with small groups in the classroom for more targeted practice in specific literacy and math skills. The weather is changing! Please be sure your child is dressed appropriately for outdoor play everyday. It is rare that we stay in inside! Please make arrangements to swap out spare clothes bags with more winter clothes. Send them in a backpack with a note in the folder and we can replace it for you. Accidents happen all the time in kindergarten, from major lunch spills to paint messes to others. The nurse does not have many extra clothes. Birthdays: We have had several birthdays so far this year. On (or near) your child’s birthday, we read a birthday book, perform a birthday chant and sing “Happy Birthday”. We also have the class stand together in a circle representing the sun. The class holds the “sun” (a yellow beach ball). The birthday child holds the “earth” (a globe beach ball). The birthday child walks around the sun for each year of their life. They also bring a birthday bag home with books, a journal, and a small gift. -SAVE THE DATE! ROOM 102 Open House will be Wednesday, December 19th, from 8:30-9:00am. This is a chance for you to come in and see your child’s busy classroom and all their work! - Winter Recess begins December 24th. Please remember to teach your child to dress themselves for outdoor winter play, especially zipping coats. I recommend sending your child’s snow gear in a separate bag, typically a grocery recycle bag works well. Be sure to read to the bottom for important upcoming dates! Also check out the photos page for many new photos including our first field trip and our visit from Jeannie the dog! In ELA this month, we have read and decorated more poems and songs for our black folders including 5 Little Pumpkins, I Like, My Pumpkin Seed, and many more. We have learned many lowercase letter sounds and how to write them. We are learning about sentences, punctuation, first sounds in words, rhyming and syllables. In writing we continue to write and draw about our weekends and things we like. We have talked about ways to write in kindergarten and no longer use “squiggle writing”. In reading we have introduced individual book bins that have small readers and the song and poetry folders. We have read many of the book donations from the book fair (thank you! ), and more books about Fall/Autumn and trees. We finished reading the chapter book Ramona the Pest and have begun reading Beezus and Ramona. Ask your child what Ramona's engagement ring was made of. Math: In addition to continuing number sense and counting this month, we have explored sorting and classifying. We have played math games including What’s Missing, Guess my Rule, and One More. We read “Tally O’Malley” and learned about making tally marks. We explored blocks and talked about their attributes (color, size, shape). We did pumpkin math, measuring our pumpkins height, weight and circumference and determining whether pumpkins sink or float. Open Circle: We have practiced “whole body listening”, ask your child to explain what this means. We have learned about how it is important to tell a teacher is something is happening that is dangerous or destructive. We have been practicing ways to calm down when we get upset, ask your child about calm breathing. We have read the Social Thinking books, Thinking Thoughts and Feeling Feelings and The Group Plan. Science and Technology: We are continuing to talk about trees. We have talked about the lifecycle of the apples and pumpkins. We have explored leaves and talked about their role for trees and what happens in fall/winter. We have drawn scientific pictures of our class tree in summer and fall. We have done drawings of our pumpkins through a scientist's eyes, and painted a pumpkin from an artist's eyes. We have 7 iPads in our classroom. We have begun using programs including Starfall, Symphony Math and Lexia. Library falls on Thursdays. We say to children that it no big deal if they forget their book. However, we are unable to bring children down to exchange their books at other times during the school week. If they forget their books on Thursday, they can just hang onto it for another week. Thanks for your understanding! Please do NOT use Lexia or Symphony Math at home, these are at-school tools :). Special thanks to Amelia and her family for sharing beautiful fall gourds with the class from their family's farm. Children will be bringing home what may appear to be trash over the course of the school year. These creations are coming from the STEAM center, and children often work very hard designing and creating these projects. This year children have built things from backpacks to candy hiders using recycled materials and string and tape. Check out the picture book Rosie Revere Engineer which speaks more about this wonderful process. -November 21st, 12pm early dismissal, no lunch at school. LOOK AHEAD-December 19, 8:30am Room 102 Open House. Please plan to bring your child to school on this day instead of the bus. Dear Families, It was a pleasure to meet and see so many of you at Curriculum Night! I look forward to working with you in the months ahead and hope to see you in the classroom for a variety of activities. Our classroom volunteer schedule is quickly filling up. Please remember to sign up only one time for this fall session so that other families can have a chance to come into the classroom. In ELA this month, we have been listening to beginning, middle, and ending sounds, playing listening games, and learning about rhyming. We have read and decorated many poems and songs for our black folders including I’m a Little Teapot, The Incy Wincy Spider, Jack and Jill, Humpty Dumpty, Baa Baa Black Sheep, and many more. Many children can recite these poems and songs by heart and we call this reading! In writing we have been writing and drawing about our weekends and learning step-by-step drawing in our drawing journals. In reading we have read about the Pigeon, Piggie and Elephant, and books about trees. We are listening to the chapter book Ramona the Pest. Ask your child to tell you something about this story, like what happened with Ramona and the red ribbon. Math: Much of this month’s math has been exploring the manipulatives we will be using this year. We have played with tiles, pattern blocks, attribute blocks, 10 frames, number shapes and unifix cubes. We have played math games including match one die and cross out. We have talked about ways to count carefully. We are charting the days we have been in school by both grouping straws into place values of ones, tens, and hundreds, and by showing days in ten frames. 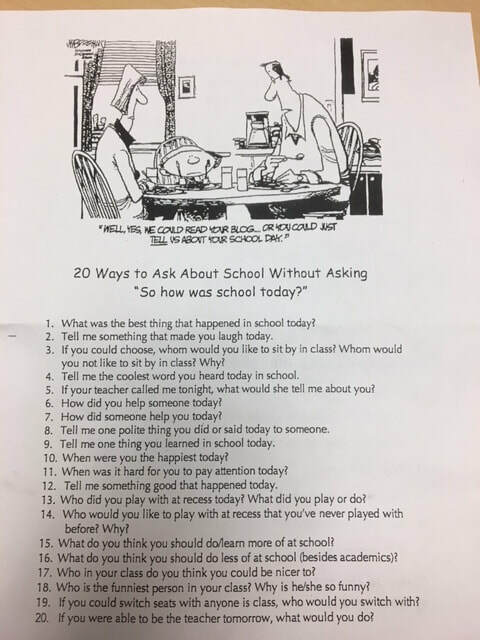 Every day we have a question of the day, where we count and track the number of yes and no answers, write those numbers, and discuss more and less. We are practicing our handwriting with numeral writing. See if your child remembers any of the numeral songs for #1-10. Open Circle: We are learning about being safe, quiet and cooperative. We established our classrooms rules- “1. be kind 2. be safe 3. take care of our classroom, and 4. have fun and try our best”. Please take a minute to discuss these rules with your child and what rules fit into those 4 categories. We have learned about being calm, and practiced 2 kinds of breathing, balloon and flower breathing. Ask your child to demonstrate these! We have been finding out what we have in common with other children in the classroom. Science and Technology: We are learning about trees, deciduous and conifer, and the changes that trees go through during the seasons. We have had a chance to explore on the classroom ipads, playing Starfall. We play many counting and story sequencing games on the whiteboard. We read about “Whole Body Listening” with our guidance counselor Ms. McManus. We show we are listening using our whole body, our ears, eyes, mouths, hands, feet, bodies, brains and hearts! Ms. Lepow, the math curriculum specialist for Claypit, came in to read Over in the Ocean, which is a picture book focused on increasing the number of sea creatures to count. We are learning our way around Claypit Hill! We have had Library with Ms. Burman, Music with Ms. Kennan, Art with Ms. Martinez, Skills Lab with Ms. Bachman, and Physical Education with Ms. LeBaron. During choice time we have explored with blocks and trains, dined in the kitchen, created with playdough, constructed with legos, poked with “push pins” and colored. Be sure to check out the website’s Photos page for lots of pictures. Conferences begin Wednesday October 10th! Field Trip to Shelburne Farm, Wednesday, October 10th. Permission slips and volunteer requests went home last week. We are only able to take 2 parents and will notify them by the end of this week. Permission Slips are due this Friday. Morning snack is meant to be a short, 15 minute affair. Please send in something small, but perhaps with some protein to help them last until lunch, which isn’t until 12:25. Arrival and dismissal are very busy times for teachers, please email Ms. Root if you have questions or concerns as we can’t really stop and talk during that time. Thank you! Please call or email the office if your child will be sick or late! Also let BASE know if that pertains to you! Classroom Donations-looking for pump bottles of instant hand sanitizer. Please email me with any questions! Welcome to Kindergarten in Room 102! Ms. Trump and I are excited to meet you all today. Here is some information about some of our routines. Please do not hesitate to ask if you have any questions. PLEASE FILL OUT THE ORANGE CARD. Please fill out the PINK information sheet for the health office. If your child is taking the bus home from school, check the bus-stop list to confirm the location where your child will be dropped off. Check our dismissal list to make sure we are dismissing your child to the correct place. Please give the orange card, school supplies and change of clothes for your child to Ms. Trump. Fill out CORI form (green) and hand into the office if you want to volunteer in the room or go on field trips. You need to show a license and it is good for 3 years. If you are dropping your child off at school, doors open at 8:30am and there is no supervision before that time. It is best to arrive between 8:30 and 8:45am to have time to unpack and settle in. Children are marked tardy after 8:50am. Dismissal at Claypit Hill is a big operation and your child’s safety is our top priority. Please review all information and make sure we have the correct information. Bus: If your child takes the bus home, he/she will be dropped of at the designated bus stop near your home. A parent or caregiver must be at the bus stop in order for your child to be dropped off. If a parent or caregiver is not waiting at the bus stop, your child will be brought back to the school and arrangements will have to be made for a parent to pick up. Please expect delays during the first week or so as it takes time to work out the bus routes. Car pick-ups: Children who are being picked up in the car pick up line will be escorted out by staff to the car line and helped into your car by staff. Please stay in your car. NOTE-car pick-ups happen after all buses have left. **If you/your child has an afterschool engagement that requires your child to leave school before the car pick up queue is done, you may have him/her dismissed (“early release”). This requires a note/phone call to the office and parents/caregivers must pick-up the child at the office by 2:50pm. Walkers: Walkers are students who are picked up by parents/caregivers who have walked to school and will meet their child outside the k wing door. Please let us know today who will be picking up your child on most days. If one day your child is to be picked up by someone other than whom you designate today, you need to inform us by written note (not email). Walkers are dismissed after the first round of buses have left. Please do not enter the k hallway at dismissal, teachers are very busy making sure everyone gets to the right place. We cannot dismiss children early for afterschool activities. If you need to pick up early you must go through the office. BASE: If your child is going to BASE afterschool, please be sure we have the correct days. When afternoon BASE plans changes, it important to let the classroom and the BASE staff know. Again, we must be informed IN WRITING each time there is a change in dismissal. Please put notes in the home school folder. We will check these folders daily. Anyone picking up your child either by car or walkers may need to show ID. On the first day of school (Thursday, September 6th) Ms. Trump and I will be waiting outside the school where the children are dropped off. Today the children will see the Pigeon that is the sign for Room 102. When they arrive at school we will be holding up the Pigeon so children know where to find us. After a few days we will encourage the children to come into the school on their own. Today you will be provided with a home-school folder. PLEASE make sure this comes to school with your child everyday in their backpack. We have lots of important work and notices that will be going home each day. Also any notes for us should be put in this folder. We will check them every morning. We ask that the children NOT bring in toys from home. Thank you for your help with this. We will be going outside mostly every day in all seasons. Please be sure your child is dressed appropriately for the weather each day. And please label everything you can! Be sure to update their spare clothes as the weather changes. We have a morning snack each day. Please send your child’s snack in a SEPARATE bag than their lunch box. This is important as we will sort lunches from snacks at arrival. Brown bags or eco friendly snack bags are great for this. Please send a healthy snack that can be eaten in 15 minutes or less. Due to the real seriousness of food allergies, please do not send in any nut products (including peanut butter) for snack. Nut products can be consumed at lunchtime. Lunch is at 12:30. Kindergartners can buy lunch or just milk using pre-paid lunch cards, or they can bring in lunch from home. Monthly menus can be found on the Claypit Hill Website. We have many special activities at school to celebrate your child’s special day (even summer birthdays!). We will not be celebrating with food in the classroom. Please mail birthday invitations and thank you notes directly to the homes of the children to insure delivery. Expect a monthly newsletter via the class webpage (located on Claypit Hill’s website) to keep you informed of classroom happenings. Also be sure to sign up for eNews (Listserv) found on the Wayland Public School webpage under the Superintendent’s office. September 12th is our kindergarten curriculum night for parents from 7-8pm. There will be a chance to sign up for October conferences at this time. We welcome volunteers in the classroom in many ways. Once our schedule is firm we will be sending signs up for various opportunities to get involved! Fill out a CORI form today if you would like to volunteer. Please do not hesitate to contact me if you have any questions or concerns. We look forward to an exciting year of learning! 9/26/17 I found the following page left on the copier at Claypit and thought it was terrific, I copied it to use with my own kids, but thought some of you might like to see it too.